When possible, I like to save my Stephen King reading for when I'm sick, especially the later King writings. When he's on, he's on just fine, but these days, far too often King suddenly diverts into odd side channels which, while providing whole other aspects of backstory, end up bogging down the book with needless data coupled to a plot that calls for quicker, more intense pacing. In other words, much of recent King could stand some aggressive edits. 11/22/63 fits into that King category. I picked it up on the Kindle, and thank God for that because it's a lot faster to skim through the bogs of backstory when all you have to do is tap the page to turn it rather than flip a page. Some people will enjoy the lengthy depictions of the Jake and Sadie romance, and Jake's twisting obsession with figuring out if Oswald really was a lone gunman. Unfortunately, these long diversions take away from the ultimate horror of the final twist and render it less effective by the time it strikes. Playing out that final twist is forced by comparison and the story suffers as a whole because of the pacing. That said, King nails the teaching life dead solid. I wouldn't necessarily call this a horror story because there is a final, sweet happy ending. Awful things happen but the ending...no, not really a horror story. It's a mainstream read. I can think of current horror authors who would not have pulled away from the last horrific twist, leaving the reader buried in a mire of despair and pain. Same's true of Under the Dome. In both cases, King backs off from the final ugly implications of where the plot appears to lead, shortening the denouement in ways that weaken the book for a genre audience while potentially adding to the appeal for a wider audience that really would prefer a positive ending. I can appreciate that appeal. Heck, I try to end my books in the same manner. You have to give the reader some sort of hope because, after all, this is fiction and not real life. In real life there may not be resolution or redemption. There may be no alternative to the howling horror that twists your life, no positive flash of joy. Unfortunately, I think King fails at providing the solid underpinning for that last positive twist. It's better in 11/22/63 than in Under the Dome. But I miss the final ugly twist of The Stand, when you realize that though the Good Guys managed to win out, Evil has still found another way to reemerge and is doing its best to resume the battle. Then again, that may be the difference between an older writer and a younger writer. Plan for a leisurely read on this one, or at the very least, be prepared to flip fast through sections that don't appeal if you're not into exploring meandering side twists of backstory. 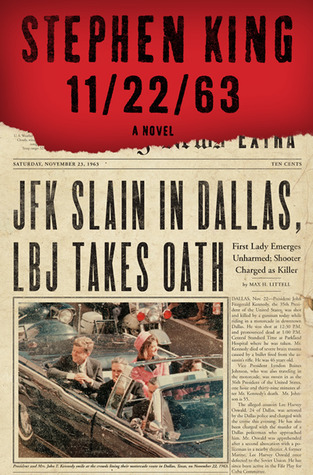 Sign into Goodreads to see if any of your friends have read 11/22/63.